Preheat an air fryer to 400 degrees F (200 degrees C). Cut garlic in half and smash with the blade of a knife. Place in a bowl with oil, salt, and paprika. Add cauliflower and turn to coat. 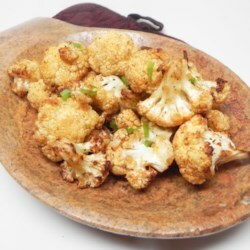 Place the coated cauliflower in the bowl of the air fryer and cook to desired crispiness, about 15 minutes, shaking every 5 minutes.